It was a painting of Disease. In this case, it was the crimson pestilence that was the centerpiece of Edgar Allen Poe's "The Masque of the Red Death," the blood-born plague that Poe described as "sharp pains, and sudden dizziness, and then profuse bleeding at the pores." And it fascinated Rice Carothers. A student at Howard High School, he graduated in 1929 and landed a job as an elevator operator in the Chattanooga Times building. But while there, he "created a stir of interest among a small group of people interested in painting and talent." Newspaper Librarian Nora Crimmins was one of those people. She purchased 10 of Rice's paintings based on books and sent them to the branch libraries. One that drew much praise was his painting of Disease from Edgar Allen Poe's "The Masque of the Red Death." In 1931, Ruth Macrea, the Chattanooga Times magazine editor, wrote that Carothers' "ability to put into the picture the vision as he has conceived it shows thought, imagination and an unusual and innate talent for composition." Macrea also noted that Rice was taking a correspondence course in art. She urged someone to take an interest in this talented but untrained artist and provide him with assistance. Rice's only artistic schooling had been what he learned at Howard and what he learned by reading The History of Art. Actually, little is known of Rice's personal life. We know he was born June 6, 1909. His father, Joseph Lemuel, worked as a barber; his mother, Nellie R., taught school at the Main Street School at 1315 Carter St. But Rice left no letters or diaries that detailed his desires or activities or the struggles he overcame as an African-American young man in the 1930s. What he did leave are some beautiful paintings and a little mystery about his life and art. His best works were landscapes, sketches and portraits. As his talent became known in Chattanooga, he painted local celebrities including Adolph Ochs, Newell Sanders and Judge Will Cummings. The oil portrait of Ochs hung in Milton Ochs' office on the third floor of the Chattanooga Times building. Col. Ochs considered it "one of the best oil portraits" he had seen in years. Newell Sanders liked his portrait so well that he sent Rice $100 and displayed the painting in a Chattanooga bank lobby for years. Several Times employees possessed small paintings created by their gifted elevator operator, Rice Carothers. Col. Ochs kept several of Carothers' paintings in his office and was instrumental in Rice's quest for professional training. Rice finally secured a place in New York City to study, and on April 17, 1934, The Chattanooga News wrote of Carothers' farewell party. He had "citizens of both races" who wished him well and spoke of his valued contributions, his "fidelity, industry, and desire to serve." E. Y. Chapin, president of the Chattanooga Public Library board, spoke of Rice's contributions to the Howard branch library and to the main library as well. Dr. J. M. Bynes, dentist, philosopher and leader in the African-American community, talked on Carothers' contributions to his race. Carothers spent 1934 to 1936 at the National Academy of Design in New York City. While studying, he also worked as an elevator operator at The New York Times. World War II did not skip Rice Carothers. He enlisted in 1942 at Camp Forrest. While stationed at Blytheville, Ark., Cpl. Carothers presented a painting of an American warplane in flight to Maj. Gen. Ralph Royce, commander of the Army Air Forces Southeast Training Center. The New York Times reported on this gift on Feb. 14, 1943. Unfortunately, not much is known of Carothers after World War II. He, his sister Delores, and his mother, Nellie, moved to Brooklyn where Nellie died in 1948. Her husband had died in 1943 and was buried in Forest Hills. Nellie was returned to Chattanooga and also buried in Forest Hills. According to Chattanooga city directories, Delores and Rice Carothers returned to Chattanooga around 1975. Rice Carothers died on June 24, 1997; Delores passed away Jan. 19, 2003. Neither obituary listed any next of kin. Not much is known of the location of the many drawings Carothers created or what he painted while in New York. He is listed in the book Afro-American Artists as the painter of the Four Horsemen of the Apocalypse housed in the National Archives. 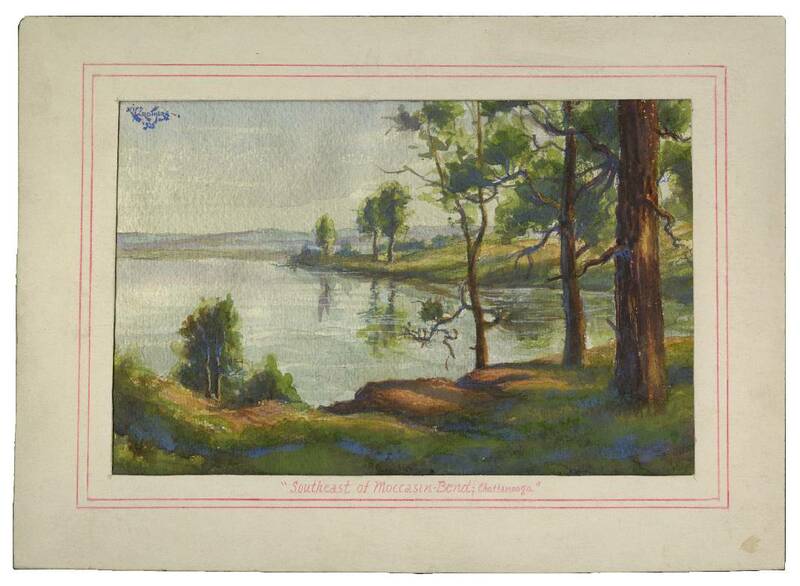 The Chattanooga Library has seven small watercolors and one pen etching donated by Howard High School in 1934. The oil painting of Judge Will Cummings is also part of the archives. The public can view the paintings by visiting the library or by searching the library catalog. These art works are all that are known of a talented but little-known Chattanooga painter. Suzette Raney is a librarian and archivist at the Chattanooga Public Library. For more information, visit the library or call 423 757-5317.